Harley is an 86 pound, Bernese Mountain Dog. I had only seen one once before and that was enough for me to want one. Harley at eight weeks old arrived at the Columbus Airport from California, a frisky puppy with boundless energy and a heart of gold. I have had many dogs in my life but Harley is the only one that will let other dogs eat out of his bowl while he is still eating! As Harley got older, he only got more affectionate. My wife says Harley starts barking for me when my car is 1/4 of a mile away and not yet on our driveway. Harley loved to gently grab my hand in his mouth, pull me over to our couch and then would jump on the couch and put both his front legs on my shoulders hugging me affectionately. He was quite the showman and I felt honored, as I hugged him in return. to Shawnee Animal Clinic where pictures of his leg showed the typical appearance of an osteogenic sarcoma in his distal left front radius, confirmed by MedVet in Columbus. I reviewed the literature on osteogenic sarcoma in dogs and various treatments. Ohio State Veterinary Hospital wouldn’t talk to me because I wasn’t a veterinarian, for which I will never forgive them. There were no good options. Our local veterinarian told us partial amputation usually led to chronic infection as the dog tried to walk on the amputated leg. Any treatment short of full amputation would likely lead to death from metastatic disease in months. 90% of dogs with osteogenic sarcoma have micrometastases in their lungs at presentation leading to death in three months without chemtherapy and within one year with chemotherapy. After spending three weeks in agony trying to do what was best for Harley, I finally agreed to amputation and chemtherapy to best prolong Harley’s life. Immediately after surgery, Harley was in shock not understanding what had been done to him at the hands of the people that loved him. It took a month for the wound in his shoulder to stop draining. It took only a few days for Harley to learn to walk on three legs. We kept him in our downstairs den during this time so he wouldn’t have to deal with our other dogs. We were afraid he would try to get on our couch and get injured but he wanted to be upstairs with his siblings and us. So after only one month, we brought him upstairs to be with his entire family. The chemotherapy seemed to upset his stomach and make him weaker, and I was concerned of cardiac toxicity, so instead of six months of treatment, we stopped it after only three treatments. One day, six months later, Harley gently, once again, grabbed my hand in his mouth and took me to his favorite couch. Then he jumped on the couch, like it was no big deal, raised up and put his one front leg on my neck, hugging me, showing me he still loved me, as I wrapped my arms around him, burying my head in his fur, hiding my teary eyes. When the other dogs ran outside to play in our backyard, Harley ran with them barely losing a step. Once he had recovered from the surgery and chemotherapy, he never acted depressed, never wallowed in self pity, but loved the life God had given him. We were told if we were lucky, Harley would live a year. March of this year, Harley celebrated being cancer free for three years, something that only happens in a very small percentage of dogs, less than 1% of the time. 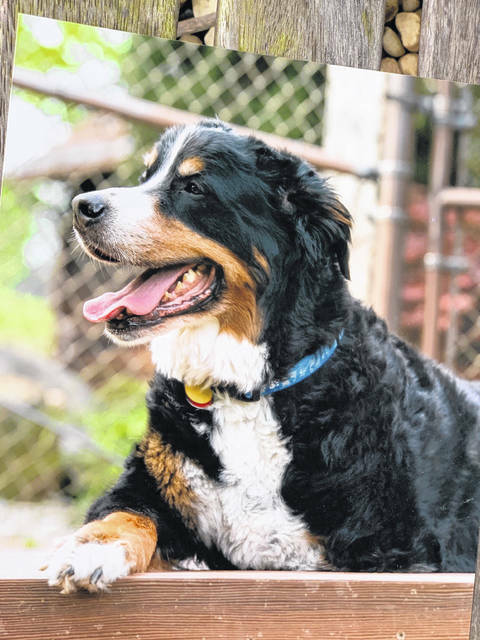 So Harley is our (big) little miracle, a long term cancer survivor, a bundle of love wrapped in the body of a dog, and for this is worthy, I believe, of a picture on the front page of the Portsmouth Times. His namesake Einstein could have taught Harley a lot about relativity, but when it comes to teaching how to accept adversity with courage, how to defeat an aggressive cancer and for a precious love of life when it would be easy to give up, Harley has much to teach us all.